SACRAMENTO, CA - APRIL 04: A Black Lives Matter protester holds an illustration of Stephon Clark during a march and demonstration through the streets of Sacramento on April 4, 2018 in Sacramento, California. 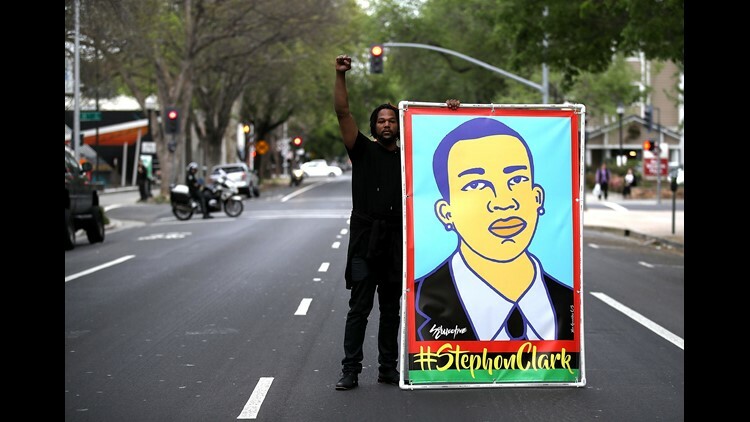 Over 100 Black Lives Matter protesters rallied during a day of action outside of the Sacramento district attorney office demanding justice for Stephon Clark, an unarmed black man who was shot and killed by Sacramento police on March 18. The family of an unarmed black man who was fatally shot by Sacramento police filed preliminary paperwork for a lawsuit seeking more than $15 million in wrongful death damages, city officials reported Thursday. Stephon Clark's family filed the forms to begin the process to seek millions of dollars in damages from the city of Sacramento related to the deadly officer-involved shooting. The forms are the first step before a lawsuit can be brought against the city. According to a Sacramento city press release, the claims seek damages “in excess of $15 million” citing nine “causes of action” related to the shooting, including negligence and wrongful death. Some of the damages sought by the family include loss of financial support, funeral expenses, attorney fees, and punitive damages, ABC 10 News reported. Clark, 22, was shot and killed by Sacramento Police on March 18 in the backyard of his grandparents’ home. Police said they thought he was pointing a gun, but it turned out to be a cell phone. Sacramento police have not released the names of the officers, saying that both have received numerous threats. The shooting remains under investigation; at least part of the encounter was filmed by police video cameras, and a police surveillance helicopter was in the area at the time of the incident. The Sacramento Bee, citing an unnamed source, said the claims were filed by Los Angeles attorney Dale Galipo and other lawyers seeking $20 million for Clark’s two children and $15 million for his grandparents and parents. The amount sought in the claims is nearly the size of the city’s $37 million parks budget, the Bee reported. But often, amounts initially sought in lawsuits are whittled down during legal negotiations and court proceedings. Protests and peaceful rallies in Sacramento disrupted traffic, blocked access to NBA basketball games and interrupted a local city council meeting after Clark was shot. His death reignited the familiar frustration and anger after similar police shootings of black unarmed men. An independent autopsy his family commissioned claimed that Clark was shot by police mostly from behind. But police later said those autopsy findings were "erroneous." A Sacramento County Coroner's report, conducted by forensic pathologist Dr. Keng-Chih Su, indicated that Clark had been shot once in the front of the left thigh, three times directly to the side, and three times in the right side of the back.